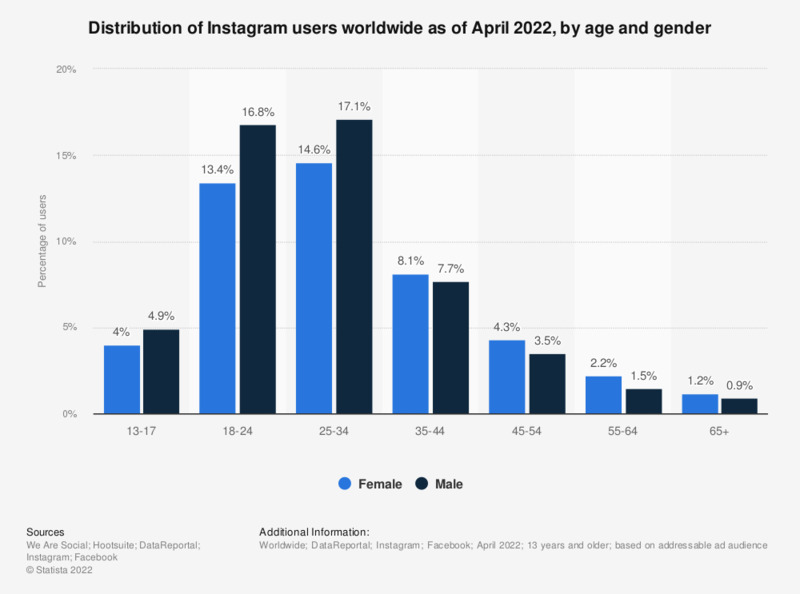 As of January 2019, it was found that 15 percent of global active Instagram users were women between the ages of 18 and 24 years old. More than half of the global Instagram population worldwide is aged 34 years or younger. As one of the biggest social networks worldwide, Instagram is especially popular with teenagers. As of fall 2018, the photo-sharing app ranked second in terms of preferred social network among teenagers in the United States, second only to Snapchat. Teenagers are highly engaged social media audiences: In an April 2018 survey, 43 percent of teen respondents confessed to checking their social media on an hourly or more frequent basis. Teens report feeling more confident, popular, and better about themselves when using social media, and less lonely, depressed and anxious. Social media can have negative effects on teens, which is also much more pronounced on those with low emotional well-being. It was found that 35 percent of teenagers with low social-emotional well-being reported to have experienced cyber bullying when using social media, while in comparison only five percent of teenagers with high social-emotional well-being stated the same. As such, social media can have a big impact on already fragile states of mind.